Ujjain being the land of the peace and spirituality nurtures the young minds trying to explore the world. Ujjain is a city in central India that is the home of Lord Mahakal – the God of Time. Here whether the times are good or bad; Mahakal becomes the hero for each one of us and this is the reason why a young lad like me could dream of changing the world. Only with the faith in God, I could think of a start up and actually make it work. Here I at the age of 18 developed the idea of starting a business and heading towards the lesser paved road of digital marketing. After one year we are now here as a team of 20+ living the dream of making the firm Hiigher, a global name. Hiigher is one of its own kinds in Ujjain, this is the first digital marketing start-up with an uber-cool office and young minds to contribute, it just cannot get any better. We here are a world in ourselves and dream to outreach the world with the services we provide. Hiigher is on the stepping stones to success and Ujjain like always is here to support the cause. The city has blessed us with a team of enthusiastic experts who are always on the go to give their utmost contribution. How We Never Wish to Stop? 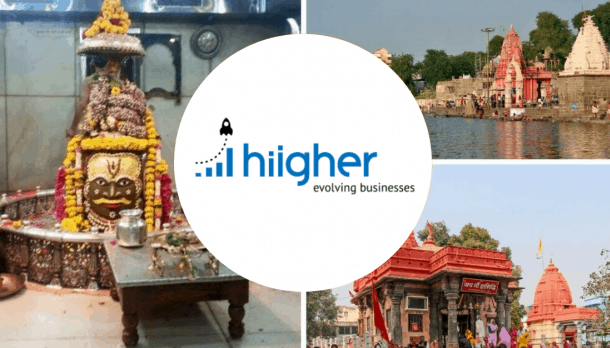 Amidst all that we are sure to rise and shine but with our feet on the ground; Ujjain is the foundation base of Hiigher and we are on a mission to expand and increase with the career options making accessible for all and sundry. Ujjain has always been the catalyst of the change as well as a comforter of the old and familiar. It has always been new as well as homely. Away from the growing competition, Ujjain has always been witnessing peace and now it is the time to blend it with development. We take pride in working towards the direction of development of Hiigher as well as that of Ujjain, moving towards the technological aspect and global reach. With our strongest desire to be successful, we are on the journey to make our native city proud and somewhere down the line wish Ujjain to be known as the city of Hiigher. Hoping for the best we are all working towards getting Hiigher.